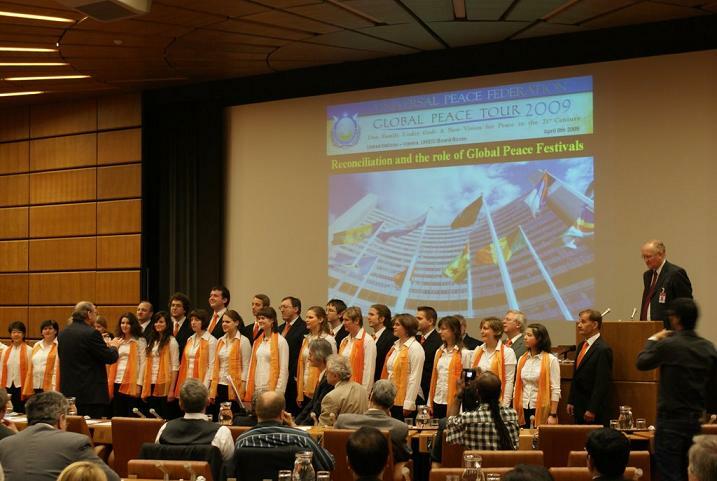 Three hundred participants and civil society leaders representing more than 40 NGOs, gathered in one of the largest NGO conferences ever held in the United Nations building in Vienna, in the UNIDO Board Room, to attend the Austrian event of the Global Peace Tour 2009 entitled “Reconciliation and the Role of Global Peace Festivals”. More than twenty embassies were represented by the ambassador or a senior staff member. 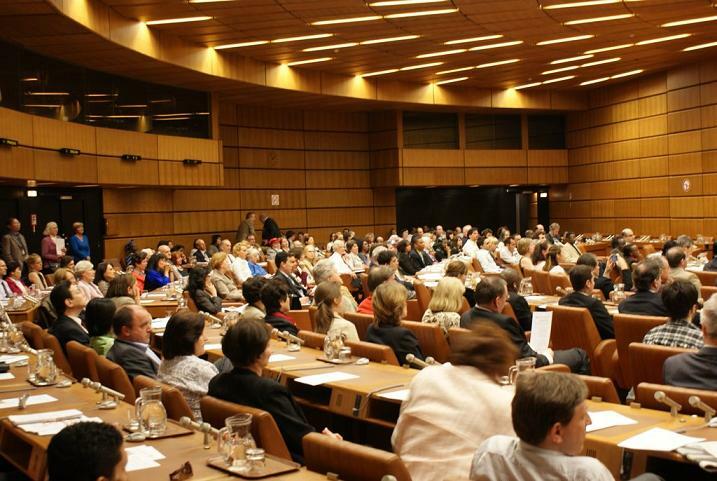 The event was made possible thanks to the support of the NGO Liaison office at the UN in Vienna. The Austrian Prime Minister, Werner Fayman, sent a message of encouragement which was read by the Secretary General of the Austrian chapter of the Universal Peace Federation, Mr. Peter Haider, who welcomed the participants. The Vienna Peace Choir sang two songs to open the conference: “The Trout”, an Austrian classic by Franz Schubert and “Let there be peace on earth” which inspired UN staff and was a refreshing change to often dry meetings. In pursuance of the United Nations resolution (61/17) to proclaim 2009 as the International Year of Reconciliation the first part of the conference, which was chaired by Dr. Christian Bruenner, a professor of constitutional law, dealt with this topic. The chairman of the UN NGO Committee on Peace, Dr. Klaus Renoldner, spoke about the steps of success his organization “International Physicians for the Prevention of Nuclear War” experienced to attain the Comprehensive Nuclear Test Ban Treaty. 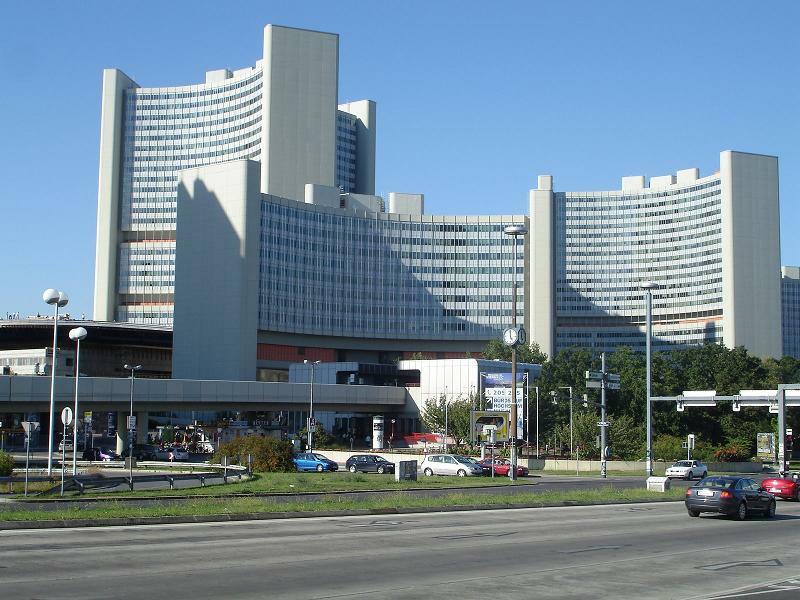 The CTBTO is the organization which aims to implement the Comprehensive Nuclear Test Ban Treaty and is located in the Vienna International Centre, Vienna. He expressed his satisfaction about President Obama's recent call “to rid the world of nuclear weapons”. Mrs. Lilly Gundacker from the Women’s Federation for World Peace, an active member of various NGO committees at the UN in Vienna, then explained their ongoing project to have “Bridge of Peace” ceremonies as a concrete step to cross the separating distance between women and also men of enemy nations. Mr. Stefan Maier, the Middle East coordinator of Caritas Austria, using moving photos, gave a lively insight into his experience in organizing International Peace Camps for children in the Middle East, which he has been doing since 1999 in a different country every year. Mag. Gudrun Kramer, co-director of the Institute for Integrative Conflict Transformation and Peace Building, spoke about her experience working as a mediator in conflicts in Sri Lanka at the time after the Tsunami and now. She explained how it took one year to find a way to build houses donated by a campaign of the Austrian daily newspaper “Kurier” for Moslem, Buddhist and Hindu flood victims in the same village. It was much harder to find a solution for members of different religions to live together, than to build the houses. The first session concluded with a speech by H.E. Kairat Abdrakhmanov, the Ambassador of Kasachstan to the OSCE in Vienna. He spoke about the determination of his country to become a member of the democratic world and about their perspectives for the chairmanship of OSCE in 2010. He explained that more than 20 different nationalities live in his country. In the new capital Astana “The Palace of Peace and Reconciliation” was built in the form of a pyramid, where a “Congress of leaders of world and traditional religions” is held every three years, the next being in July 2009 under the theme “The Role of Religious Leaders in Building a Tolerant World in Conditions of Globalisation”. As a European counterpart, Dr. Leo Gabriel, a founding member of the World Social Forum, spoke about “From a Global Crisis to Global Peace - The Self Empowerment of Civil Society”. He mentioned a poster which he saw a few weeks ago in Belem, Brazil, where two bare-foot boys speak about the global crisis, saying that 2/3rd of the world’s population actually lives in permanent crisis. He reported that in a recent conference he attended in the Russian Academy of Sciences in Moscow, it was postulated that for capitalism this crisis might represent something similar to the fall of the Berlin Wall for communism. In conclusion he expressed his hope that the GPFs be part of a worldwide, grassroots movement, just as Obama’s rise to presidency was also carried by the support of the ordinary people in the United States. A video was then shown summarizing more than 20 GPFs in 2008 in all parts of the world from Paraguay to Mongolia, from England to the Philippines. The spirit of hope, the cultural diversity and the images of excited young people was overwhelming. The Mongolian Ambassador to Austria and the International Organisations in Vienna, Dr. Jargalsaikhan Enkhsaikhan spoke about the situation of Mongolia. While his country experienced political division last year, the GPF brought new energy to its people at home and to Mongolians abroad when they saw the excitement generated in the young people there on the internet and television. The final speaker, representing the young generation, was Pascal Haider, who was designated as the coodinator for the GPF in Austria. He gave a dynamic speech on the vision of young people. “Vienna should become a ‘City of Peace’ and together with the support of the UN, we the young people of Vienna, can make a unique GPF here”. He called upon the city to support this project and concluded with a declaration put together by a group of young activists of UPF, who have begun to introduce the GPF to students in several universities in the city of Vienna. The GPF theme song "Where Peace Begins" sung by the Austrian Peace Choir, together with the young Korean soloist Yoon Ja Joong, concluded the conference, which was followed by a buffet dinner reception in the restaurant of the Vienna International Center.